The galaxy lies at a distance of 32 million light years from Earth and has an apparent magnitude of 10.2. Its designation in the New General Catalogue is NGC 3379. M105 occupies an area of 5.4 by 4.8 arc minutes of apparent sky, which corresponds to a linear extension of 54,000 light years. The galaxy is difficult to see in small binoculars and easier to find in large binoculars and small telescopes. 3-inch telescopes show a small, round faint patch of light, while 8-inch telescopes reveal a larger object, but do not show more detail. Like any elliptical galaxy, M105 is not particularly impressive to observe because details of its structure cannot be made out in any kind of telescope. 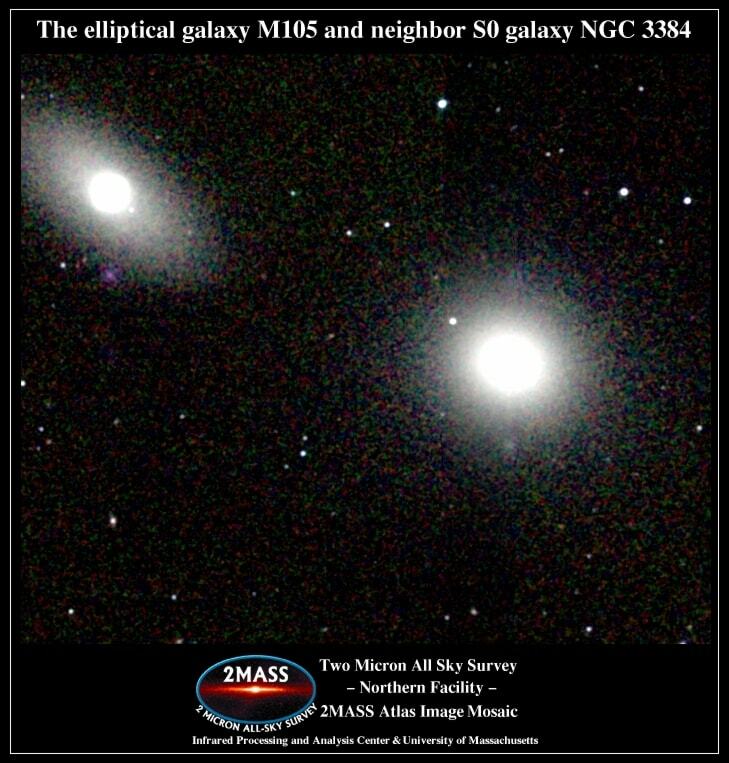 10-inch telescopes will reveal two neighbouring galaxies, NGC 3384 and NGC 3389, in the same field of view. 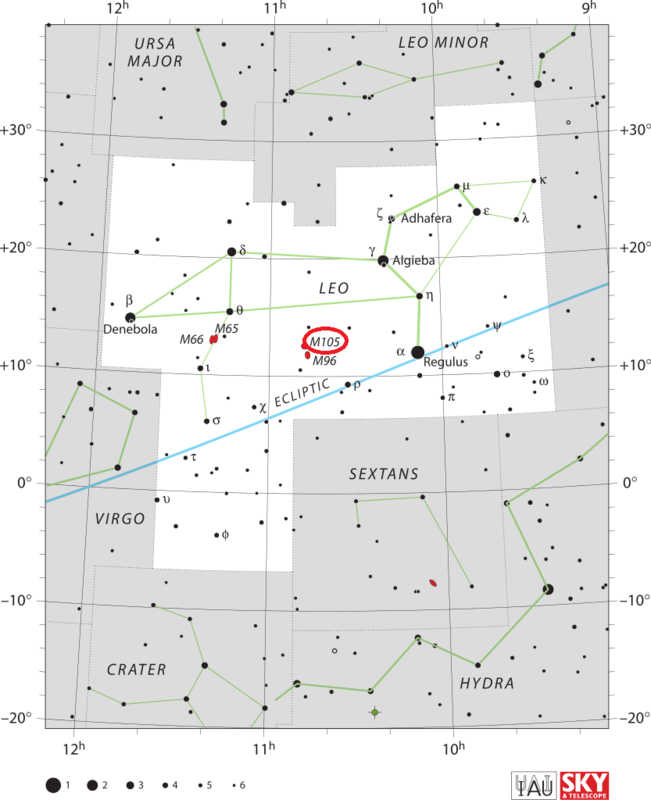 Messier 105 can be found along the line from Regulus, the brightest star in Leo, to Denebola, which lies 24 degrees east and a little north of Regulus. The galaxies M95 and M96 are also located in this region of the sky. M105 is the northernmost member of the group. M96, the brightest of the three galaxies, is positioned 50 arc minutes south of M105 and M95 lies 40 arc minutes west of M96. The best time of year to observe the galaxies is during the spring. 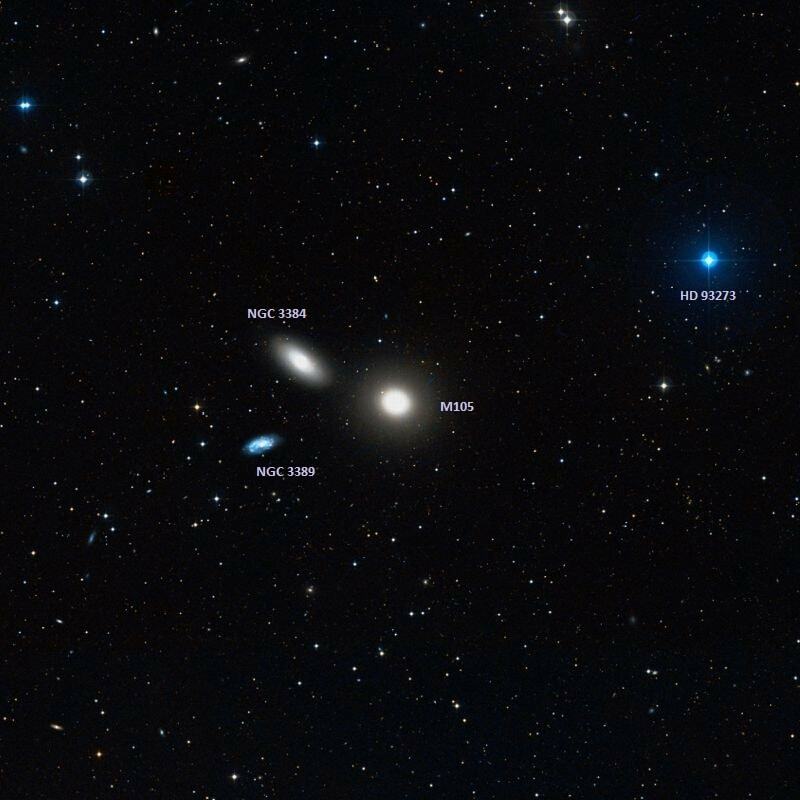 Messier 105 is a member of the M96 Group (Leo I Group), a group of galaxies that also includes Messier 95, Messier 96, and at least 21 fainter members. M105 is the brightest elliptical galaxy in the group. The galaxy is receding from us at 911 km/s. 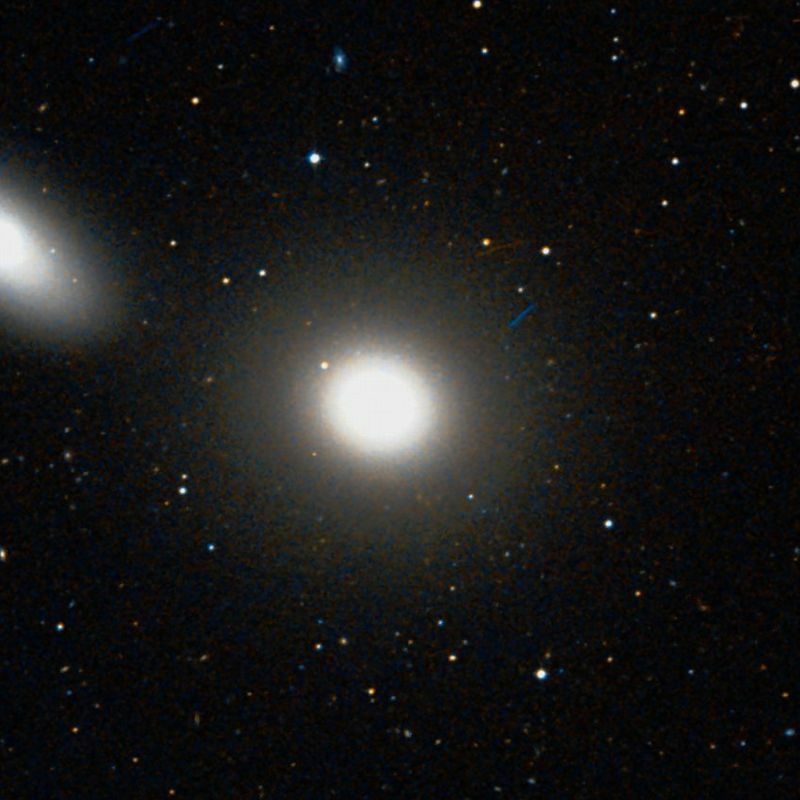 Two relatively bright galaxies can be seen in the vicinity of M105. NGC 3384, a magnitude 10.9 barred lenticular galaxy, is probably a member of the M96 Group, while NGC 3389, a magnitude 12.4 spiral galaxy, is believed to lie in the background. Messier 105 and its companion NGC 3384 are surrounded by a vast ring of neutral hydrogen gas. The ring has a radius of 650,000 light years (200,000 parsecs) and is a site where star forming activity has been detected. The estimated mass of the ring is about 1.8 billion solar masses. Observations with the Hubble Space Telescope have revealed that the stars near the galaxy’s centre are moving very rapidly. These findings led astronomers to conclude that M105 contains a supermassive black hole with an estimated mass between 140 and 200 million solar masses. The galaxy itself has an estimated mass of about 100 billion solar masses. A few young stars and clusters have been discovered in the galaxy, indicating that new stars do still form in some elliptical galaxies, even if the process is a very slow one, with one Sun-like star formed every 10,000 years on average. Mr. Messier mentions there on page 264 and 265 two nebulous stars, which I have discovered in the Lion [Messier 95 and Messier 96]. I find nothing to correct for the given positions which I have determined by comparison of their situation with respect to Regulus. There is, however, a third one, somewhat more northerly, which is even more vivid than the two preceding ones. I discovered this one on March 24, 1781, 4 or 5 days after I had found the other two. On April 10, I compared its situation with Gamma Leonis from which followed its right ascension 159d 3′ 45″ and its northern declination of 13d 43′ 58″. Interestingly, Méchain discovered M105 a few days before finding the Pinwheel Galaxy (M101), but M105 was not included in Messier’s final published edition of the catalogue. Messier 105 (right) and NGC 3384 (left). Atlas Image mosaic obtained as part of the Two Micron All Sky Survey (2MASS), a joint project of the University of Massachusetts and the Infrared Processing and Analysis Center/California Institute of Technology, funded by the National Aeronautics and Space Administration and the National Science Foundation. William Herschel discovered M105 independently on March 11, 1784 and catalogued it as H I.17. A pair of bright-class nebulae, sp [south preceding, SW] and nf [north following, NE] of each other, on the Lion‘s belly, discovered by WH [William Herschel] in March, 1783, and No. 758 [NGC 3384] in his son’s Catalogue; while at a small distance to the nf [north following, NE] is a neat but minute double star. These are two of the three nebulae described by both Herschels [Messier 105 and NGC 3384]; but the third [NGC 3389] I cannot distinguish, unless it be a glow in the sf [south following, SE], in a vertical line with two small stars. We now approach a region where these mysterious luminous masses are scattered over the vast concavity of the heavens, in truly boundless profusion; and in them, all true Herschelians must view mighty laboratories of the Universe, in which are contained the principles of future systems of suns, planets and satellites! The objects here treated of, are among the nebulae included within a round patch of about 2deg or 3deg in diameter, in the apparently starless space of the Lion‘s loins. Now the observer unprovided with an equatorial instrument – and unfortunately many of Urania’s most zealous followers are in that predicament – may wish to fish it up. If his telescope be of capacity for grasping sufficient light, the field may be found, under a moderate power, south of the line which joins Regulus and Theta Leonis about 10 deg east of, and nearly on the parallel with, the former. This, with [NGC] 3384 and 3389, forms a striking group, a right-angled triangle whose shorter sides are 7′ long. [NGC] 3379 is nearly round, 2′ in diameter; very bright; no spiral structure discernible. 33 s.n.